Show true, everlasting love with a heartfelt message. This sweet star pendant is intricately designed in silver plated rhodium and engraved with the message "I Love You To The Moon And Back". This pendant necklace makes for the perfect gift for those most precious in your life. 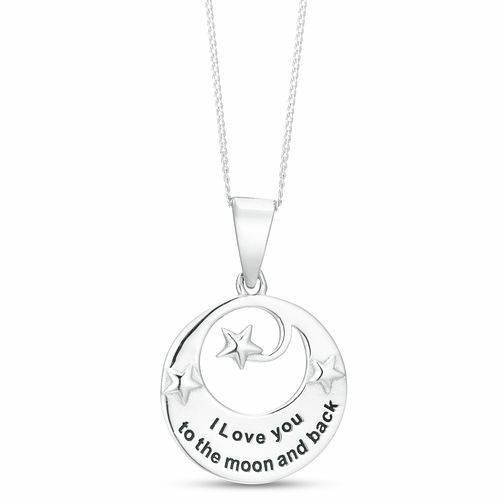 Silver Rhodium 'Love You To The Moon And Back' Pendant is rated 5.0 out of 5 by 3. Rated 5 out of 5 by Anonymous from Great Mother’s Day present We bought the product on line for a mother’s day present for my mother in law. Excellent service fast delivery and the product for perfect for her. She loves it. Rated 5 out of 5 by Anonymous from Beautiful necklace Beautiful necklace bought as a mothers day present which was well received. Great quality for the price with a lovely shape and inscription.